On the right at No. 179 is Edwin Smith’s ironmonger’s shop (now Partymania), with metal buckets and pans stacked outside for sale. 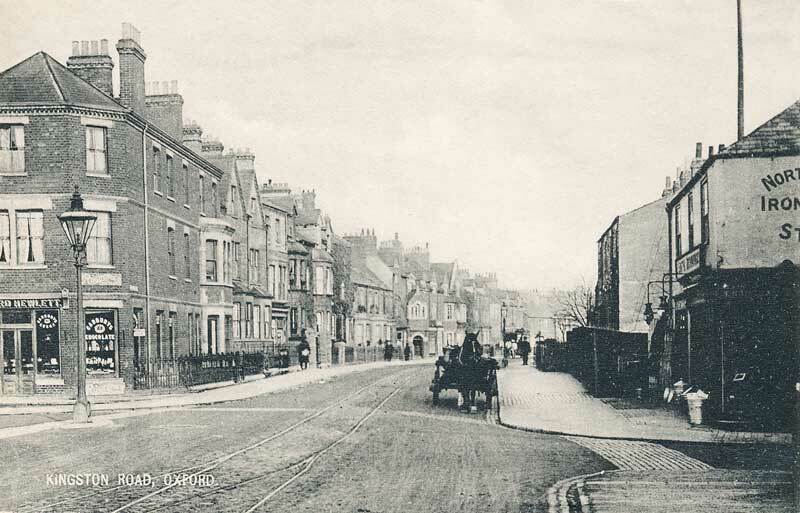 The numbering of Kingston Road follows the old, pre-1880s style. (It has never been changed to the more modern style introduced in the 1880s which places odd numbers on one side and even numbers on the other.) Hence it starts at the south (town) end with No. 1, runs consecutively 1–2–3–4–5 northwards up the west side, crosses the street, and runs back down towards town, with the result that the highest and lowest numbers, 1 and 179, are opposite each other in the forefront of this picture. Like most of the other roads in Walton Manor that were owned by St John’s College, Kingston Road is named after one of the college’s livings. The street did not exist in the 1860s, when there were just gardens here, with a lane called Cabbage Hill winding through them. Two terraces of artisans’ cottages (numbered 119–28 and 159–64) were designed by C. C. Rolfe in 1870 and are now Grade II listed. Kingston Road was originally in SS Philip & James parish, which had a mission room in Hayfield Road. In 1894 this mission room was replaced by a St Margaret’s chapel of ease, on the corner of St Margaret’s Road and Kingston Road. Twelve years later in 1896, just twelve years after it opened, the chapel of ease became an independent church, so since then Kingston Road has been in St Margaret’s parish.